Sound "A velvety texture in this mids"; "the highs were vivid, incisive and exceedingly clean." "While the 2.5s have serious weight and heft and all the good things that happen down low, they still retain the wonderful detail in the upper bass and midrange, along with the richness and presence that the [Focus Audio] Signature speakers are known for." "The Master 2.5s go deep but still sound tight." "Over time I appreciated their balanced, full-range sound more and more." Features The Master 2.5 has "a 1" Scan-Speak Revelator tweeter, a 5 1/2" Eton midrange with a special phase plug designed by Focus Audio, and an 11" Eton woofer." "The Master-series cabinets are also much larger and heavier than anything in the Signature line, and this, coupled with the fact that each Master model is a true three-way with a very large woofer, helps generate far deeper bass and greater output than any Signature series speaker." was that I had to sit quite a bit farther from these speakers than with most that I listen to." "Covering up the drivers with the grilles is essential because without the grilles the tweeters look like eyeballs staring at you. I recommend going grille-less for serious listening, though. They pop off and on." Value "While the Master 2.5 isnt cheap, its certainly not outlandishly priced given the competition in the marketplace. If youre a fan of Focus Audios other speakers, the 2.5 is a well-priced entryway into the companys statement-level Master series." Im quite familiar with Focus Audios speakers. I've reviewed the FS688, FS788, and FS68SE, and Ive also visited the factory in Toronto numerous times. All this makes me well suited to review the new statement-level Masters-series speakers. I know the companys design philosophies and objectives. However, when I saw the first two speakers in the Master lineup -- the Master 2 and Master 3 -- I declined reviewing them for one simple reason: Theyre huge! I didnt even want to entertain the thought of trying to put speakers as tall -- or taller -- than I am into my listening room, which is on the third floor of my house. Both speakers weigh more than I do too. Then the Master 2.5 came along -- sort of a Master 2 cut in half -- and that seemed much more manageable, particularly because its a little lighter than the others (although not by as much youd think), and its shorter than I am (which will be hard for some who have met me to believe). Its also less expensive than the Master 2 or 3, which are priced at $28,500 USD and $22,360 per pair respectively. The 2.5 is just $18,590 a pair and, as youll read, it offers better performance than the lower-priced Focus Audio speakers I already reviewed and quite a bit of what the Master 2 does but in a smaller, lighter, less-expensive package. For people like me, the 2.5 is the Master-series speaker to buy. Focus Audio has always prided itself on its parts quality. All of the company's Signature-series speakers feature top-of-the-line Eton midrange and bass drivers and Scan-Speak Revelator tweeters, which are also what the Master-series speakers use. While the design objectives for both series are essentially the same, there are noticeable differences. 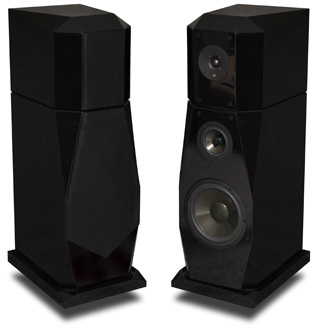 For example, all Signature speakers are two-way designs, whereas the Master-series speakers are three-ways. The Master-series cabinets are also much larger and heavier than anything in the Signature line, and this, coupled with the fact that each Master model is a true three-way with a very large woofer, helps generate far deeper bass and greater output than any Signature series speaker. There are differences within the Master series as well, although the parts and build quality are the same. For example, the Master 2 and 3 have two tweeters, two midrange drivers and two woofers in a vertically aligned W-M-T-T-M-W configuration. On the other hand, the Master 2.5 comes with one of each driver in each speaker -- a 1" Scan-Speak Revelator tweeter, a 5 1/2" Eton midrange with a special phase plug designed by Focus Audio, and an 11" Eton woofer. The reason for doubling-up drivers in the Master 2 and 3 is mostly to improve power-handling and output capabilities. Two drivers operating over the same frequency range can deliver greater output than one. Likewise, two drivers operating over the same range can offer lower distortion than one at matched SPLs, because theyre not working as hard. Therefore, the Master 2 and 3 are for very large rooms in which there might be a need to move a serious amount of air. Do you need such capability? The answer will depend on your room and listening habits. I blasted the daylights out of the 2.5s in my very large room and never, not once, did I feel that I was approaching their limits, even though my ears surpassed theirs. Therefore, Im not the kind of person who will need the Master 2 or 3, and this is one of the reasons that I believe the 2.5 might be the Master-series speaker to buy. After all, if the sound quality of speakers is the same, why pay more if you dont need to? The 2.5s cabinet measures 43"H x 13"W x 18"D, and each speaker weighs 150 pounds. The cabinet is MDF of varying thicknesses -- 1" to 2". Suffice it to say that the 2.5 is substantial. Its piano-black finish is gorgeous, but covering up the drivers with the grilles is essential because without the grilles the tweeters look like eyeballs staring at you. I recommend going grille-less for serious listening, though. They pop off and on. The only downside to the 2.5s design is that it is a short, squat speaker, which also means its quite imposing in a room. Its not the kind of speaker you can tuck away neatly. It is designed to deliver big sound, so you cant get away from cabinet volume. I suspect that most people who buy a speaker like this wont be inclined to hide it. Its a showpiece. The crossover is housed up top, behind the tweeter. Its probably placed there is because the tweeter doesnt need very much cabinet area behind it, whereas the woofer does. Consequently, Focus Audio put the big crossover parts there so they wouldn't take up needed space in the lower cabinet. The woofer crosses over to the midrange at 200Hz, while the midrange transitions to the tweeter at 2kHz. Crossing the tweeter over at this frequency, which is on the low side, results in well-matched dispersion characteristic at the top point of the midrange and the low point of the tweeter -- a design goal of Focus Audio as well as many other speaker manufacturers that understand the need for matching drive units this way for proper dispersion. The 2.5 is ported to the rear. Focus has also tweaked the 2.5 with top-quality parts, such as high-quality crossover components, silver wiring throughout, and dual sets of rhodium-plated binding posts for biwiring. Focus has always had a reputation for building high-quality speakers -- top to bottom, inside and out -- and the Master 2.5 is no exception. The speakers ratings are also impressive. Focus claims bass extension down to 20Hz -- meaning that the speaker is being sold as truly "full range" -- and the sensitivity is given as 88dB/W/m. Furthermore, the 2.5 is said to present an 8-ohm impedance, which is a friendly load that virtually all amplifiers can handle (Focus recommends 50-500Wpc of power). On the other hand, the Master 2 and 3, with double the drivers, arent quite so friendly. Theyre said to present a 4-ohm load, which might give some amplifiers that cant handle low impedances a bit of a tough time. That's another reason the Master 2.5 might be the better bet for some listeners. I drove the Master 2.5s primarily with a Simaudio i-7 integrated amplifier, a Slim Devices Transporter (a WiFi-capable DAC with many additional features) and Theta Data Basic transport as source. The digital cable from the transport to Transporter was an i2Digital X-60. Analog interconnects from the Transporter to the i-7 were Nordost Valkyrja. Speaker cables were a biwire set of Analysis Plus Silver Oval. The Master 2.5s were set up in my large listening room with about 7' behind them to the front wall, almost 5' to either side wall, and approximately 10' from the listening position. As youll read, these distances took some time to determine. I learned over time that the Master 2.5s need space to breathe in order to sound their best. Focus Audio speakers have a family sound, which is not surprising given the similarity of components from model to model and the singular design philosophy that runs throughout the product line. What, therefore, do you get for about double the price of the top Signature model, which is what the 2.5 represents? Much deeper bass than any of the Signature speakers can muster, higher output capability, and a certain effortlessness, most likely the result of the Master 2.5 being a true three-way with a big woofer that handles the bass and relieves the midrange driver of having to go down so low. In a nutshell, the Master 2.5 takes the best of the Signature sound and adds deep bass and prodigious output. With that big 11" woofer moving air, the 2.5s have a certain grandness and majesty to their sound that speakers like their FS688 and 788 hint at but cant really explore. Furthermore, while the 2.5s have serious weight and heft and all the good things that happen down low, they still retain the wonderful detail in the upper bass and midrange, along with the richness and presence that the Signature speakers are known for. I vividly recall playing Johnny Cashs American IV: The Man Comes Around [Universal 063339] and marveling at the sort of weight that smaller speakers just cant equal but still being mesmerized by how clear and articulate everything was. Its impossible without measurements to know if a speaker is truly full range (i.e., a low point of 20Hz with reasonable output capability), but in my very large room the Master 2.5s seemed, at least by ear, like they reached that low. And theyre not just reaching that low by stretching and therefore sounding out of control. One of the hallmarks of other Focus Audio speakers hasnt been so much their bass depth but the control, texture and detail that they show down low. Whether its the inherent nature of the Eton drivers or something that has to do with Focus Audios design goals, or some combination of those things (or something else entirely), Focus Audio speakers get it right in the lower reaches by delivering what's down there with authority and control. Its the kind of thing good speakers should do but dont always. The opening two tracks of the Cowboy Junkies' The Trinity Session [BMG 8568-2-R] (the Canadian release sounds far superior to the US releases Ive heard) simply thunder in my room, but theres no boominess or overhang. The Master 2.5s go deep but still sound tight. Furthermore, the Master 2.5s can play loud. For a short while I was throwing some bass-heavy, metal-edged music at them and found that they were able to really crank it out in an ear-splitting, high-volume way without giving out in any obvious fashion. As I mentioned, Focus Audio has the larger Master 2 and 3s for even higher-output situations. What I found the 2.5s to deliver was far more than sufficient for my needs. I never approached their limits. The midband was very good, but this was an area I had to fiddle with to hear all that it could offer. In my original setup, sitting about 6' from the speakers, I found the midrange recessed and the imaging diffuse, with performers placed too far back in the stage. In fact, as I listened from this position, I pictured the 2.5s frequency response with a wide, shallow trough through the midband. Perhaps if the speaker were measured at this distance thats what wed see. What I discovered, though, was that I had to sit quite a bit farther from these speakers than with most that I listen to. I usually like to sit within 8' from the speakers, but I found the Master 2.5s to sound best from at least that far away, something I confirmed with Focus Audios designers. I finally settled on about 10', and could have moved even farther back if I wanted to. At that point, the midrange came into proper balance; vocals and instruments that occupy this range were fleshed out far better. Furthermore, the speakers regained a velvety texture in the mids, something that Ive noticed with all the other Focus Audio speakers Ive reviewed and consider a hallmark of their sound. Obviously, then, youll need a pretty big room for the 2.5s, because you not only want to sit a fair distance away, youre likely going to want to keep a reasonable distance between the speakers and the boundaries so you dont overload the room with the bass these rear-ported speakers can put out. I had about 7 1/2" to the front wall, 5' to the side walls, and still plenty of space behind me -- even though I was now sitting pretty far away. Soundstaging and imaging also improved sitting so far back, showing good lateral spread and delineation from front to back. However, the stage still didnt knock me out the way it can with some speakers. Images were not carved out of space, and I suspect that part of the problem has to do with the distance from which I was listening. Essentially, the farther back you sit, the more the room comes into play. With that, the imaging becomes a touch obscure. Thats why I like to sit close. So, with this speaker, your listening distance will involve a tradeoff -- imaging precision versus midrange prominence. The Master 2.5's high frequencies, though, were quite special, and there wasn't a tradeoff here. This is also something that Ive said about the other Focus Audio Signature models that also use the Revelator tweeter. They all sound infinitely extended and supremely detailed, but not to the point of annoyance. The Master 2.5 was certainly not bright- or etch-sounding or anything like that. Rather, the highs were vivid, incisive and exceedingly clean. The only criticism some might level is that theyre too detailed, but I like such a sound. To my ears, the Master 2.5s high-frequency balance is spot-on. In fact, in this regard these speakers are exceptional. In the end, though, dissecting a speaker into sonic characteristics tells you about how each sounds, but enjoyment comes from the overall performance of the speaker. I had the Master 2.5s in my room longer than most speakers -- about six months -- and I used them through a variety of reviews. I was impressed with them from the get-go, but over time I appreciated their balanced, full-range sound more and more -- no small accomplishment given all of the gear that makes its way through my listening room. Around the same time I was listening to the Master 2.5s, I reviewed the Aurum Acoustics Integris Active 300B, a full-range speaker system that comes with its own amplification and cabling and costs $30,000. That seems like a big difference in price compared to the Master 2.5s, but I suspect that the person who buys the Focus Audio speakers will also partner them with an amp and cabling of commensurate quality and will end up in the same ballpark, price-wise, as the Aurum Acoustics system. First, the most obvious difference: The Master 2.5 takes the traditional "passive" approach, while Aurum Acoustics, on the other hand, removes the guesswork with its active amp-speaker system. In my room, I found the Aurum system easier to set up than the Master 2.5s, and I could sit at my preferred sub-eight-foot distance away. The soundstaging and imaging from the chair were superior to what I achieved through the Master 2.5s at any distance. The level of clarity and detail and the evenness throughout the frequency range were attention-grabbing. The Aurum system impressed me with how it acted like a conduit to the music. It was astonishingly transparent. On the other hand, the Master 2.5s sounded just as balanced when I determined the right distance away from the speakers, but the sound was more lively and visceral overall. The Master 2.5s could also play louder, more than likely due to the Simaudio i-7 integrated amp I used, which never ran out of steam in my room. The Master 2.5s also sounded a little grander, which is a hallmark of Focus Audios sound. There was a richness and presence in the upper bass and mids, and the treble was certainly more lively. But both speakers were equal in terms of detail retrieval and overall resolving power. The Aurum system is certainly no slouch there; in fact, the resolution of a full Aurum system -- one with the Integris CDP CD player-preamplifier up front -- is state of the art, which says a lot about the Master 2.5 in comparison. As for reach in the bass, the Aurum system has a 10" woofer in a sealed enclosure, while the Master 2.5 has an 11" woofer and a port. Both stretch comfortably to the very bottom, at least from what I can hear, and I cant reliably say which goes deeper. These are both full-rangey speakers, and they can move decent amounts of air. One difference is that the Focus Audio speakers can play louder when powered by a beefy amp. The Aurum Acoustics speaker system is always limited in its ultimate loudness by its amplifier. Which speaker system is better, then, will be determined most by what your needs are. Do you want an all-in-one design where everything from the amplifier to the speaker driver is designed to work as one? In that case, Aurums system is without equal, and without much competition because there are few active speakers of commensurate quality available. Or do you want to go the traditional route, mixing and matching your speakers with amps and cabling to best suit your needs? In that case, the Master 2.5 is not the only speaker out there -- the speaker market is more than 99% passive speakers -- but it is a great choice if you have a fairly large room and are looking for a full-range high-end speaker capable of producing first-rate sound. The Master 2.5 is the best Focus Audio speaker Ive reviewed. Moving from the top-of-the-line Signature model, the FS888, to the entry-level Master 2.5, involves a big jump in price -- from $8770 to $18,590 per pair. However, to deliver truly deep bass and produce prodigious output levels requires a corresponding jump in cabinet and driver size, and these dont come cheap. Furthermore, you cant make a two-way stretch to 20Hz and still have a midrange that sounds right. Perhaps Focus Audio could have done something in between, and maybe they still will, but the big jump from Signature to Master is one they felt they had to make to ensure that the Master series stood alone. The Master 2.5 takes all the best qualities of Focus Audios lower-priced speakers and adds truly deep bass and remarkable output capabilities. Although you could also look to the Master 2 or 3, I suggest that you start with the 2.5. This speaker can play extremely loud and is not hard to drive, making it a suitable partner for a variety of amplifiers. Furthermore, although it needs a fairly big listening room, I suspect that the Master 2 and 3 might need an ever bigger one if you really want to hear what theyre about. While the Master 2.5 isnt cheap, its certainly not outlandishly priced given the competition in the marketplace. If youre a fan of Focus Audios other speakers, the 2.5 is a well-priced entryway into the companys statement-level Master series. Price: $18,590 USD per pair.